Now Available! Introductory Price! Order Now!!! 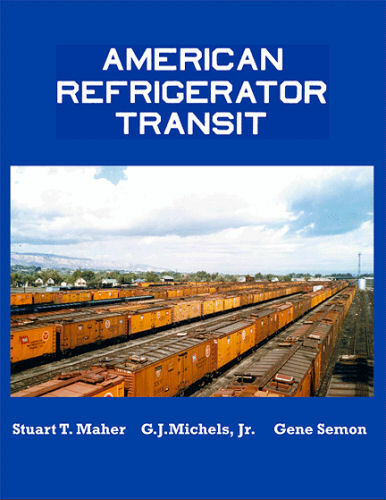 Among America’s largest operators of refrigerator cars was American Refrigerator Transit. The ART was founded by Jay Gould in 1881 to serve all his railroads of that day, including the Wabash, Missouri Kansas and Texas, and particularly Missouri Pacific and subsidiaries. After 1925, Denver & Rio Grande Western was added. Primary business in the early years was meat transportation, but this gradually shifted to perishables, particularly from Texas and Colorado. Change came in the 1960s. Norfolk & Western took over Wabash in 1964 and in 1969, D&RGW moved its perishable business from ART to Fruit Growers Express. In 1973, Norfolk & Western pulled out of ART, and with the acquisition of Missouri Pacific by Union Pacific in 1983, all remaining ART properties then disappeared into UP. This large book contains not only a complete history of ART but extensive and thoroughly illustrated information about the refrigerator cars of ART. Rail historians as well as enthusiasts of the Missouri Pacific and Wabash will be fascinated by this book. Hard cover.